Every once in a while it’s nice to groove. 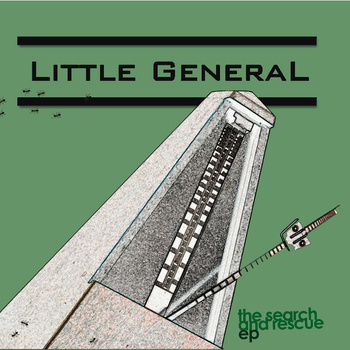 Young Edmonton trio Little General are setting up to provide that groove. The guys have released their debut The Search and Rescue EP and it is filled with catchiness in the form of heavy bass riffs and light guitar riffs. As lead singer Joshua Hundert said, the band were so focused on their music that they kind of forgot about guitar. Not that this is a bad thing- hearing bass take precedence is an interesting difference. Hundert’s voice seems to suit the music perfectly. The music is generally a lot of fun and he seems to have fun with it too. This is most evident in the song “Hard To Love” where Hundert sings “Am I hard to love?” The song is very smile-inducing. The EP’s second song “Anyhow” shows glimpses of subtlety. Unsurprisingly it is heavy on bass, but gently flourishes the song with hand claps that just add more fun to the mix. “Break Each Other Down” starts off as a song that looks like it could be formulaic but shows a refreshingly experimental side involving distorted bass riffs and god knows what else. Very interesting. Finally the EP ends off with “Waiting Outside” which has an intro of just drums and bass. The almost tribal rhythm is a great backing of the song. For such a young band they’ve got a clear idea of what they want to do- write really catchy music. And they certainly succeed. Once they figure out who’s doing what I firmly believe this band can write a really great record. Not that this is bad by any means whatsoever. The EP is can be streamed or purchased via Bandcamp.